I think I use this on myself more than my horses! In fact, I have it on my arm right now where I burned myself making muffins. I'm allergic to fire ant bites, but Marigold takes the pain away and helps heal them! My friend got stung by wasps one time, and I pulled it out of my tack box and told him to put it on. He was amazed by how fast it worked - there was no stinging! Of course, it also works for my horses. I have used this stuff for years and no matter what I use it for, be it the horses or the kids with scraped knees and sting,...I have never been disappointed. It's a great product, every home should have it whether you have horses or not! I've used this product for years and have always been pleased with the results. On November 9, 2013, a 60lbs dog attacked me on my right arm and on the right side of my face. Rushed to the ER by ambulance and 108stitches in my face... I came home with my face and arm throbbing, needless to say, the neosporin was NOT an option!!! I just happened to have a grooming box in my truck with MARRIGOLD POCKET HEALER!!! I started applying MPH to my face and arm. It can also be used as a topical antisthetic, applied every 4hrs, I didn't have any pain!!! And, since it's in beeswax, it didn't melt and run. My Drs. at Vanderbilt were amazed, they could not believe how much my face had healed in 2wks!!! They finally asked me what on earth was I using?!?! I just showed them the jar of MPH and they had to get Dr. Dan's information!!! I never leave home without it!!! You really need to get this! This is an awesome first aid product. Bug bites are a major problem here in Florida. 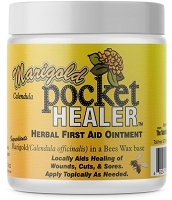 A nice coating of Marigold Healer keeps the wound clean, and the insects off. I've never had one become infected either. I always used "Swat" for horse injuries but I prefer that this is homeopathic, and I think more healing. My horse was rubbing her tail and I had tried several products. I used the Marigold and it worked. She stopped rubbing and her tail looks great now. I also like it as you can use it around the eyes. Great product. This stuff is amazing! I have one jar in my bathroom and one in the horse tack box, one for the dogs (great on my dog's winter sore pads), and the squeeze tubes for quick "easy" use. Nothing to harm and everything to heal. Thanks, Dr. Dan!